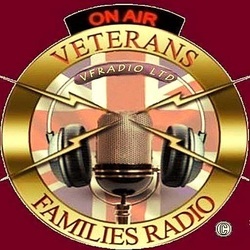 Veterans Families Radio & Falklands Radio are proud to announce that after some major negotiations, we can let you all know, that we at Veterans Families Radio in The UK, are Joining up with Falklands Radio, in The Falkland Islands, down in The South Atlantic. 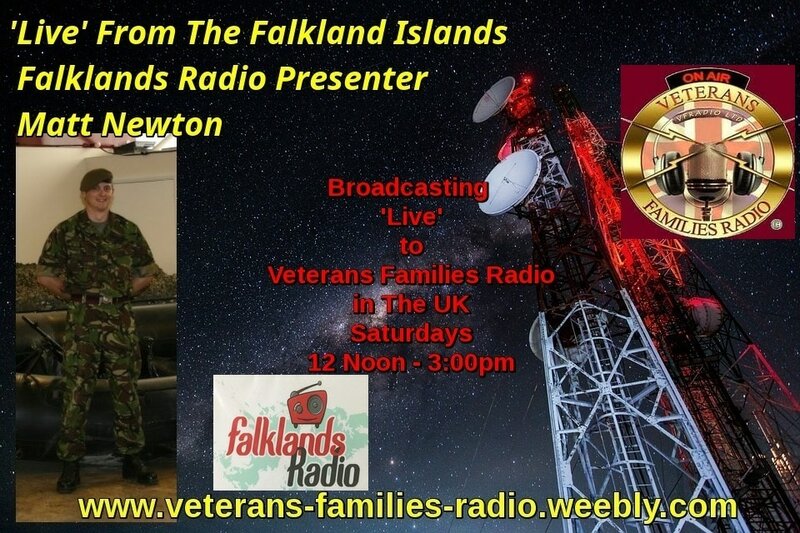 To bring you some of their show's ' LIVE ' from the Falkland Islands. This is something we at VFR are proud to have achieved. We would like to say a huge thank you to Christine, Falklands Radio Station Manager, and Jason Lewis, presenter at Falklands Radio, and Matt Newton ( Falklands Radio Presenter ), for all their help in achieving this Joining of the two stations. 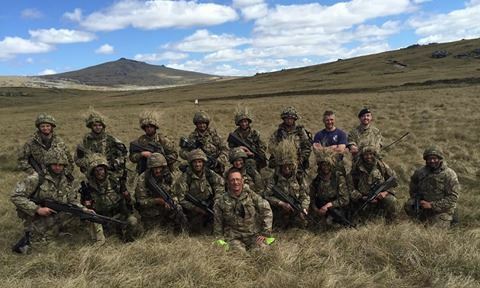 If you served In the Falklands and would like to reconnect, please drop us a line to lazz15@hotmail.com . We will do our best to pass on anything ie: A request for a song, say hello to anyone who lives there, or Maybe Serving down there with The British Forces. 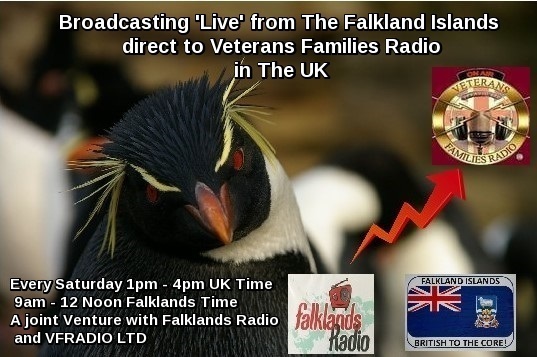 The 1st ' Live ' show from Falklands Radio we are sharing is to be on Saturday 1st of October 2016, at 1:00pm to 4:00pm ( UK Time ). That is 9:00am to 12 Noon Falklands Time. These will continue up to & including Saturday 29th October 2016. As the Clocks go back in The UK by one hour on 30th October, the Next Saturday ' Live ' Show on the 5th November will be 12 Noon to 3:00pm ( UK Time ) and remain at 9:00am - 12 Noon ( Falklands Time ). Any additional shows will be announced on here & on our respective Station's Schedules. 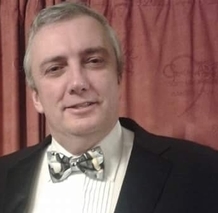 My Personal thank's to my Station Manager Tom Mcgreevy, for his help and Input In securing what we hope will be a great success for VFR and Falklands Radio. We hope you will Join us on Saturday for Jason's show, and of course all future Shows. ​ Jason arrived in the Falklands, the home of his Grandmother for the first time in 1989 as an 18 year old from Surrey. 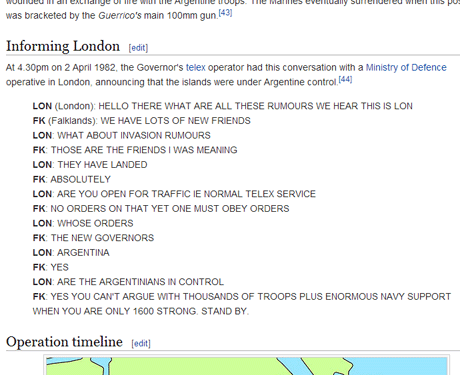 Jason has been working part-time on Falklands radio for years, they just can’t get rid of him. It started of innocently enough, asked to come in for a chat for a few minutes about the latest albums being released it soon turned into the chart show which he presented until 2014. It soon became apparent he wasn’t satisfied with just his radio show and therefore you would often find him covering other shows including Soul blues rock n roll, best of and the eighties/nineties shows. With Jason Growing up in the Eighties the music from that era does heavily effect his musical tastes, however you won’t find many genres he doesn’t like. Many of us have guilty pleasure, music that we listen to but wouldn’t admit to most, however since Jason has been given access to the airways he has come out about his love for novelty music, he has a huge collection, only probably beaten by one other in the Islands and he works for the radio station as well. Outside of Radio Jason is normal on the outside and works in the IT industry. He however like most in the Falkland’s does a whole host of other activities including tour guiding, which fills his needs of local history, AMDRAM, where he will act, produce, direct and help backstage. Plus he has a wife and two kids to keep him sane. ​ The show is really a three-hour science experiment of looking into the mind of the host Jason Lewis. It might disturb you to find out what makes him tick. You will find music from all the decades and genres, gossip and odd news, weird surveys, comedy, history of the islands and the jokes. We need to warn you about the jokes, listen at your own risk. ​The Falkland Islands are an archipelago in the South Atlantic Ocean on the Patagonian Shelf. The principal islands are about 300 miles east of South America's southern Patagonian coast, at a latitude of about 52°S. 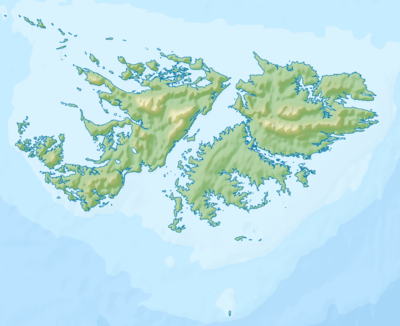 ​ The islands' capital is Stanley on East Falkland. 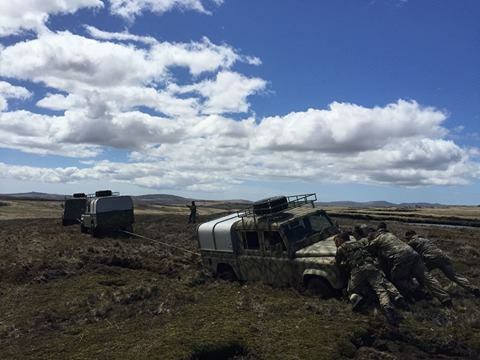 ​A Private in the Falkland Islands Defense Force, Samantha Brownlee challenges the role of women in the military while setting her sights further afield. As a keen runner, the Falklands offer her a backdrop of stunning natural beauty and an opportunity for reflection about future aspirations and careers. By leaving the islands to train and study, Sam hopes to one day return as a more valuable asset to her community and the islands as a whole. After all, home is where the heart is. *This episode was filmed one day before the 30th anniversary of the 1982 invasion of the Islands at a time of increased tension and security. 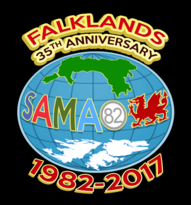 We were the only crew granted inside access to the Falkland Islands Defense Force to help further tell Sam's unique story. 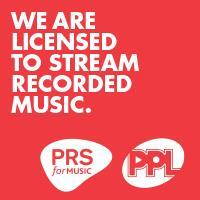 If you are watching these Video's, Please ' MUTE ' the Large Station Player near the top of this page. A Female Member of The Falkland Islands Defence Force. For Queen and Country follows two recruits, Jacob and Marcus, as they embark upon their 12 week training programme to become privates. The new recruits face live firing exercises, camping out in brisk conditions and all the tough training required to be a proficient member of the Islands defence force.